I’ve had the opportunity to travel quite a bit as a photographer the past few years. Trips to New York, Japan, London, and places all around Canada. 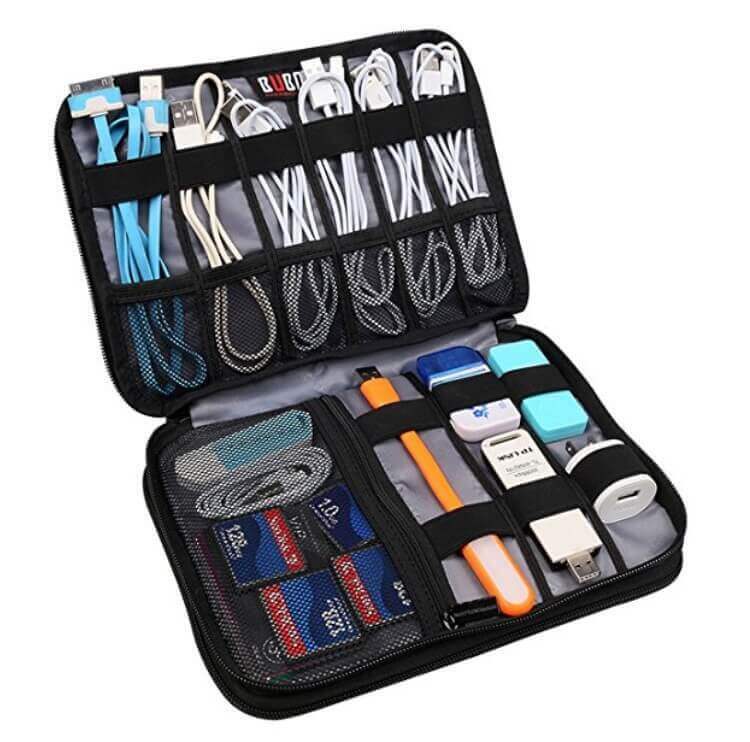 One of the absolute best travel tech bag essentials that I’ve carried along has got to be my tech accessory organizer. It took me a while to find the right one, but after seeing what accessory pouches other creatives were carrying, I think I’ve found the best tech accessory organizers on the market. I wanted a case that was well-made and an organizer which I would be proud to carry around in public. How functional your tech organizer is also depends on what you plan to carry in your accessory organizer. Additionally, it’s important to first figure out the type of tech accessories you want to be storing within the accessory organizer and purchasing an organizer based on that. 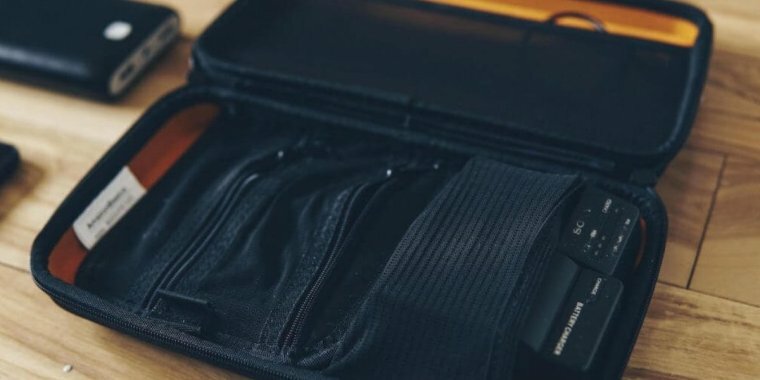 I’ve found some great travel cases over the years and have compiled them into a list to help you better decide which tech organizer is best suited for you. Have a look and let me know if you have any other suggestions for tech cases that I might have missed. This AmazonBasics carrying case is my favorite tech organizer for many reasons, but mainly because it’s a hard case so it has durability and fits well into any luggage I’m carrying. The AmazonBasics electronic organizer ensures that my valuables aren’t being crushed. I sometimes store hard drives into my organizer and even if I drop this case (I advise you don’t), I could trust this case to protect my items. The outside of the casing is molded EVA plastic material, while the inside has stretch mesh pockets. The interior is all orange which I find suits the black casing well, so it’s also stylish if you care about that. The biggest thing to takeaway from this case is just how well-built it is. With all of the other options and alternatives on the market, you can trust this tech organizer to hold up through your commutes. If you have a look at the reviews on Amazon, you’ll know exactly what I’m saying. 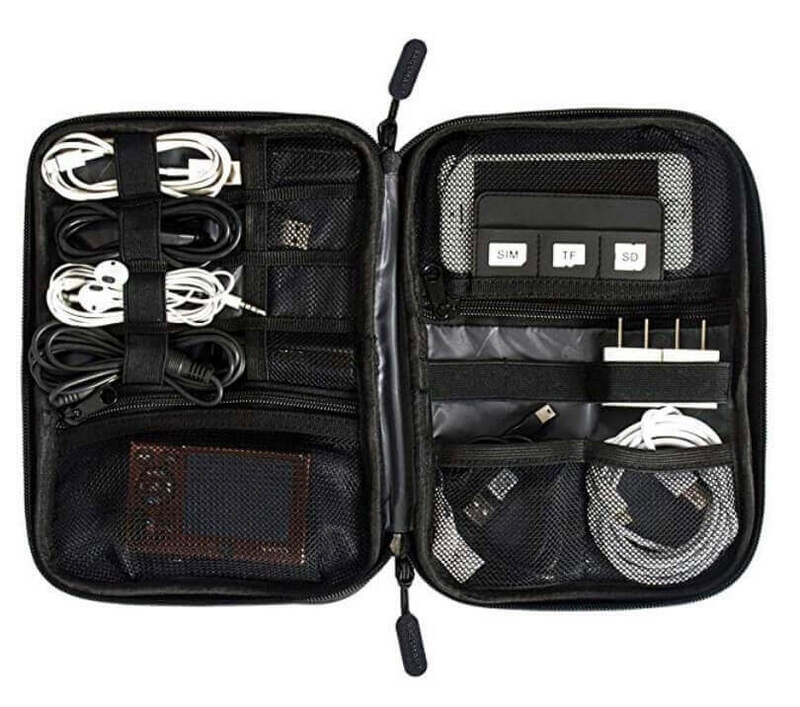 The next tech accessory organizer I’m going to recommend is the electronics case by BAGSMART. The brand offers several versions of this tech organizer, but this one is different because it is a soft-shell. I picked the soft-shell because this would be my go-to if I didn’t want a hard-shell. I would pick a soft-shell organizer over a hard-shell because of how much slimmer it is. It might now offer as much protection, but if you’re mainly looking to store tech cables and cords, than I would recommend you get a soft-shell organizer instead. 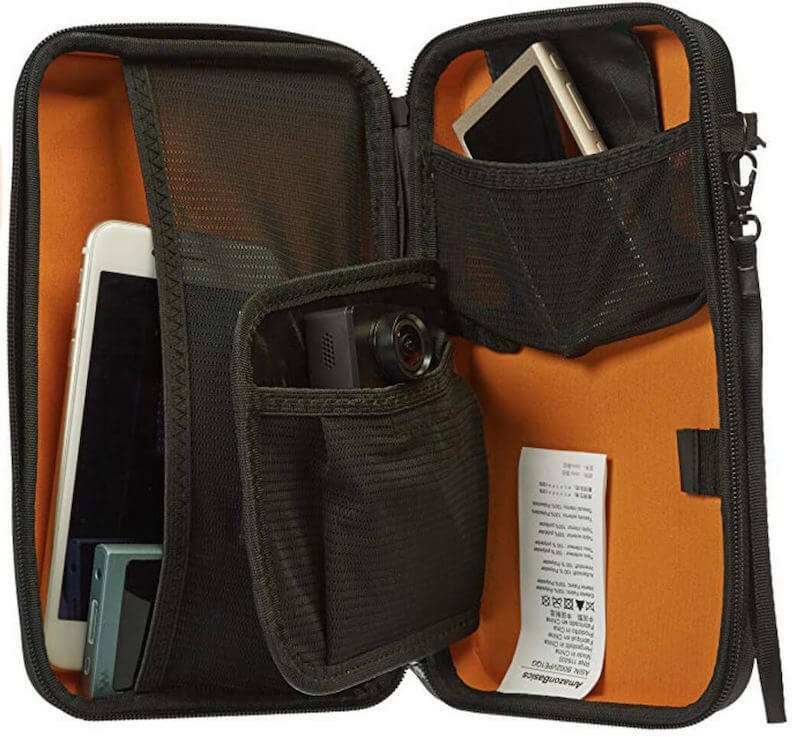 This BAGSMART tech accessory case comes in black, grey, or blue and has mesh pockets on the inside with cable holders as well. This is a slim tech case which would fit perfectly for every day commute – properly sized to fit into your everyday carry bag or backpack. The BUBM electronic accessory organizer is the perfect hybrid if you’re looking for a tech case that can carry both your electronics and accessories. 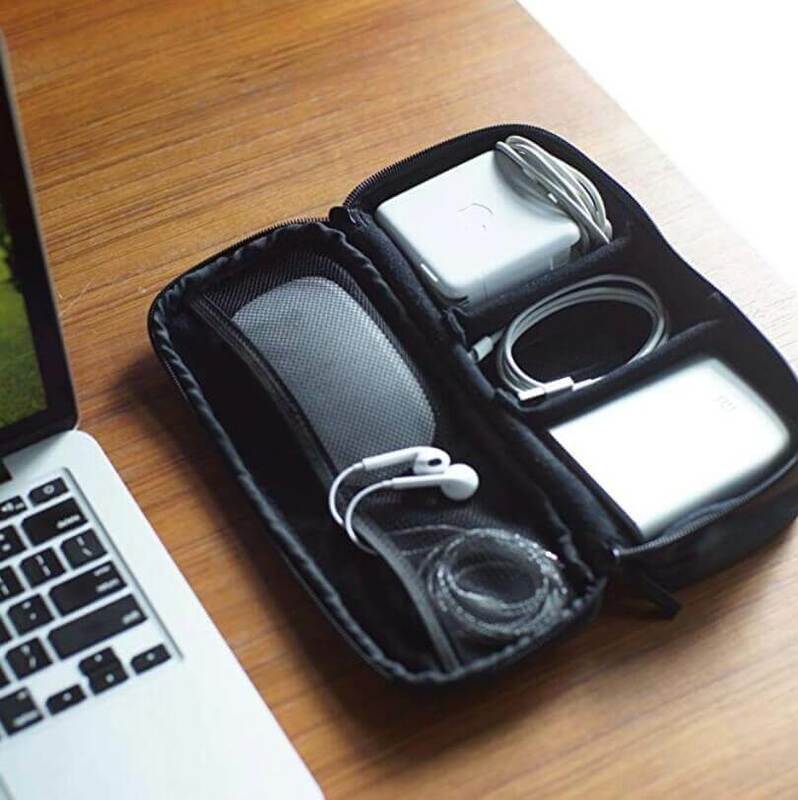 This BUBM case has multiple layers so you can store your cables and cords on one side, while filling the other side with electronics such as an iPad Mini, hard drives, smartphones, etc.. The overall durability and protection seems similar to the BAGSMART organizer, but definitely less protective than the AmazonBasics case. The material on the BUBM accessory organizer is semi flexible, but is made water resistant and with heavy duty material. My only concern would be the the flexibility of the case. The hard case almost guarantees that the pouch won’t bent, but a semi flexible case still has some room to curve. This is a good option if you’re looking for a hybrid carrying case that has versatility in its functionality. Last, but not least is this leather organizer case by Dpark. What’s very unique about this accessory organizer is the fact that you can customize the spacing to your needs. It works similar to a camera insert or a typical camera bag, where you have velcro pads to re-adjust. Having this customizability allows you to be more flexible in what you want to carry. If you’re looking to carry more electronics, you can remove pads or increase the size of the spacing. Additionally, if you want to carry more accessories, you can decrease the size in between the velcro pads. Plus, the pouch has mesh pockets on the top which can be used for different purposes as well. What makes this organizer stand out compared to the other 3 I’ve mentioned so far is the look and design of the case. No question, it is by far my favorite looking tech organizer with the leather and canvas build. Additionally, the accessory case is slightly longer in length, but is shorter in width compared to the other organizers. This might be more beneficial if you’re looking for a more narrow case. Which electronics organizer did you end up choosing? Do you have any other suggestions for a tech accessory organizer? Let me know down in the comments below!